A whale which swam up the Thames will be left alone in the hope that it will find its own way home. To me, that has a certain rhythm and elegance. 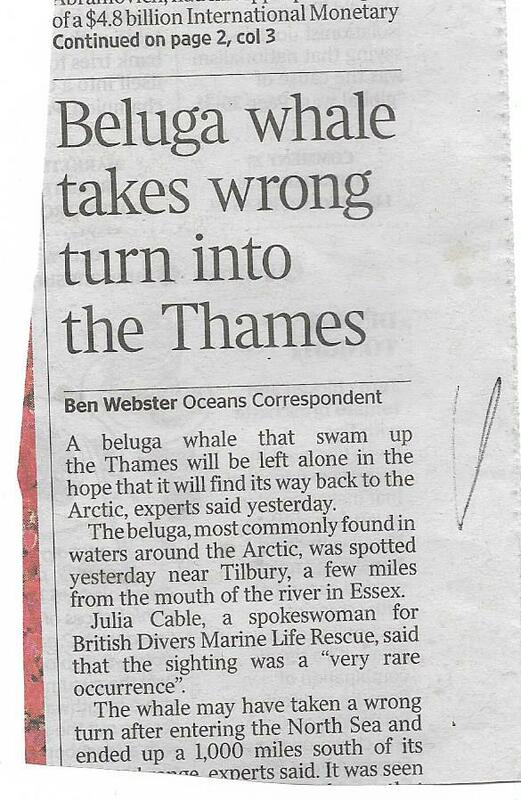 Instead, it is made clunky with the unnecessary information that it is a beluga whale and that it comes from the Arctic, both which are repeated in the second par (and ‘beluga’ is in the headline for good measure). You really do not need to add ‘experts said yesterday’, or to repeat ‘yesterday’ in the second par. If you say ‘a whale which’ instead of ‘that’ (actually grammatically better) it saves repetition with ‘in the hope that’. In the third par, is it necessary to say ‘a spokeswoman for’? Surely ‘Julia Cable of the British Marine Divers . . .’ would be sufficient? It is my opinion that subs are born, not made, and the person who found this an acceptable piece of work will never make a sub.